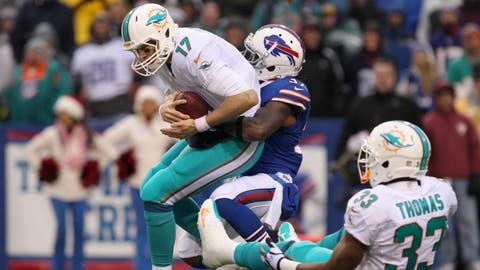 Dolphins quarterback Ryan Tannehill is sacked by Bills defensive back Nickell Robey during the second half Sunday afternoon. The Miami Dolphins took the field Sunday in full control of their playoff destiny. Wins at last-place Buffalo and against the New York Jets would give Miami its first postseason berth in five years and second in the last 12. 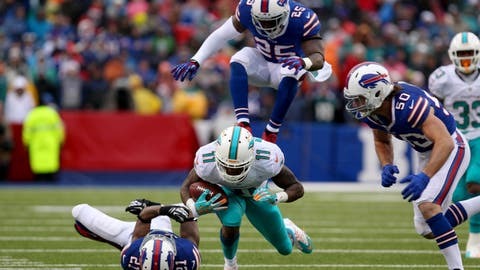 The Dolphins were beaten soundly on both sides of the line of scrimmage Sunday and lost to the last-place Bills 19-0, snapping the Dolphins’ three-game winning streak. It was Miami’s second loss to Buffalo (6-9), which won 23-21 at Sun Life Stadium on Oct. 20. Miami was held to a season-low 103 yards of offense and managed just six first downs in a road loss to Buffalo. On a blustery day with 30-degree temperatures in Buffalo, the Dolphins (8-7) were outgained 390-103. Folks, that’s known as a landslide. Miami trailed 10-0 at halftime after being outgained 143-47 despite winning the time of possession (15:56 to 14:04). If the Dolphins are to make the playoffs in the AFC, they will need a little help. First they must beat the Jets. Additionally, either the Ravens (8-7) must lose to the Bengals or the Chargers (8-7) must beat the Chiefs. The Dolphins would win a head-to-head tiebreaker against the Chargers and would also prevail in a three-way tie at 9-7 with both San Diego and Baltimore. 1. Miami’s pass protection reverted to early season form. And the result was ugly. Buffalo had seven sacks to raise Miami’s league-leading and franchise-record total to 58 sacks allowed. Although the offensive line certainly has had problems this season — e..g. the loss of both guard Richie Incognito and tackle Jonathan Martin — the unit had been playing well in recent weeks. Despite facing pressure much of the season, Ryan Tannehill hadn’t missed a snap — until being sacked midway through the fourth quarter. He limped off the field and was replaced by Matt Moore. Moore connected with Brian Hartline on a 50-yard pass play … then threw an interception on the next play. Tannehill returned later on but it really didn’t matter. The game’s outcome virtually had been decided. 2. The Dolphins failed to run the ball — and that’s an understatement. Miami ran for 14 yards overall. No, that’s not a typo. Lamar Thomas rushed three times for 8 yards (2.7) — not good, but better than Daniel Thomas (nine carries, 6 yards, 0.7). The problems both running the ball and with pass protection contributed to Miami going 2 of 14 on third down and being forced to punt 10 times. 3. Miami’s defense couldn’t stop Buffalo’s ground attack. Unlike the Dolphins, Buffalo succeeded at running the ball — something it actually had done well this season. The Bills rushed for 203 yards, with Fred Jackson (111 yards, 19 carries) leading the way. Buffalo ran out to a 10-0 halftime lead after rushing for 62 yards (compared with Miami’s 9). 4. You know things are bad when Brian Hartline drops passes. The usually reliable Hartline dropped a long pass on third and 13 in the second quarter. The receiver later failed to handle a first-down pass in his chest midway through the third quarter. For the game, Hartline had two catches for 53 yards. 5. Never assume anything in the NFL. It’s amazing how fans and media forget this primary rule weekly when it comes to predicting the outcome of games. Sure, on paper Miami seemed to have an edge over Buffalo. But the difference between most NFL teams is relatively small. Miami face a division opponent, on the road, in the cold and the Bills’ home finale. Plus, a Buffalo strength (pass rush) exploited a Miami weakness (pass protection).